The Tioga Hotel was built in 1926 and was one of the first completely fire-proof structures in the state. The building is now home to The Nest Extended Stay Hotel. The building is listed on the National Historic Register. The gargoyles at the top of the building beckon visitors to enjoy the comforts of this renovated historic hotel. 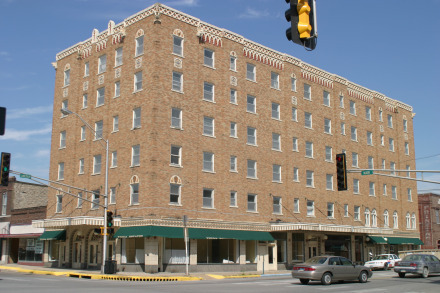 Travelers can stay in a room named for a famous Kansan and may even run into one of the ghosts that are said to inhabit several rooms. And you couldn't ask for a better location when visiting Chanute. The Nest Extended Stay is only a steps away from museums and art, shopping and a variety of dining destinations. Make The Nest your base when visiting Chanute and other cities in southeast Kansas.